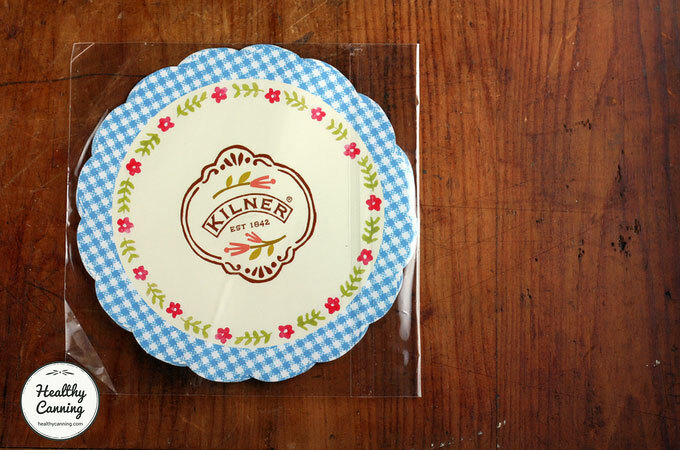 Kilner is an English brand name of home preserving supplies. 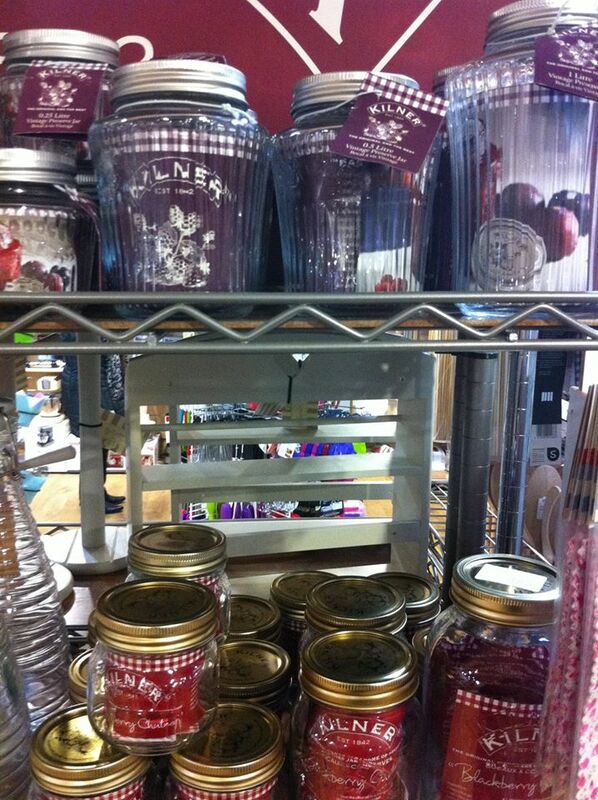 Many different types of jars, flasks, bottles and preserving accessories are sold under the Kilner name. 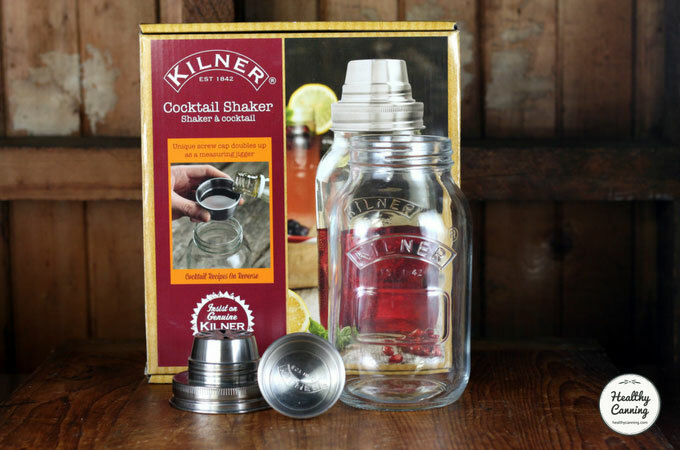 Kilner also sells kits for related preserving ranges such as sloe gins, and home beer brewing, and items for churning butter. They don’t, however, issue any printed books. The Kilner brand is owned by the Rayware Company, which owns other well-known names such as Mason Cash (the famous brown mixing bowls), etc. Kilner’s jars are currently made in China (as of 2017). Though the company maintains it is “world-famous”, it is pretty much unknown in the North American part of it at least, but as of 2016 (ish) the brand has started to try to crack into that market. 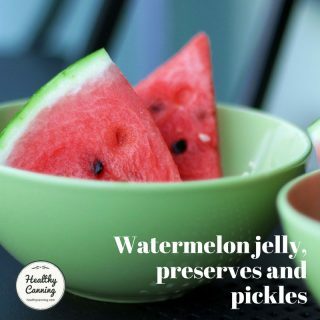 We are unable to recommend their recipes and home canning advice, and suggest that you instead use their canning equipment in conjunction with tested recipes from reputable sources who have stayed up to date with the latest in home food preservation safety knowledge. 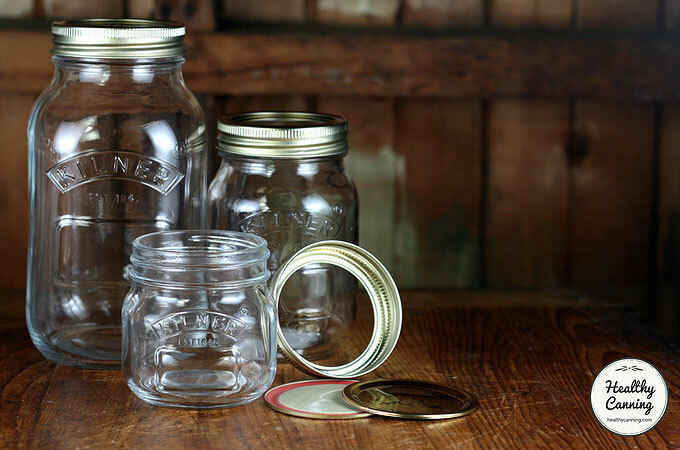 Kilner makes standard-sized Mason jars with standard, regular-sized (70 mm / 2 3⁄4 in) mouth sizes. The jars come in familiar quarter-litre, half-litre and one litre sizes — that’s 1/2 US pint, 1 US pint and 1 US quart. They take the standard, two-piece metal lids that everyone in North America (and New Zealand) will be used to. 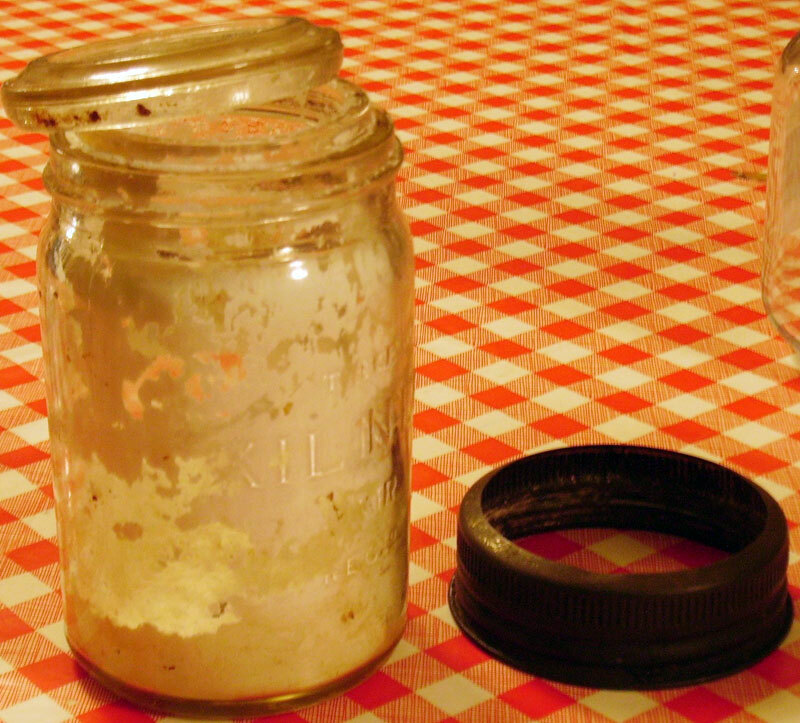 On the Kilner web site, these jars are filed under the “Preserving Jars” section. Note: In February 2018, Kilner introduced its wide-mouth preserving jars in .35 litre and .5 litre sizes. We have yet to confirm the exact lid mouth size on that. Shown above are the everyday workhorses in the Kilner product line: the quarter-litre, half-litre and one litre Mason jars (1/2 US pint, 1 US pint and 1 US quart.) 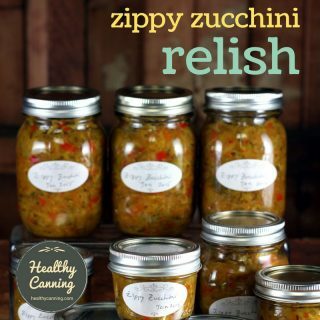 They are regular-mouth (70 mm / 2 3⁄4 in) jars that take standard two-piece canning lids. The clean sides make them easy to label. The three sizes of standard Mason jars. Showing the screw band, and both sides of the canning lid. Each standard Kilner Mason jar comes with a complimentary label. There’s a designated, raised spot on the front of these standard jars for a label, but really, because the jars are smooth-sided, you can affix a label anywhere. 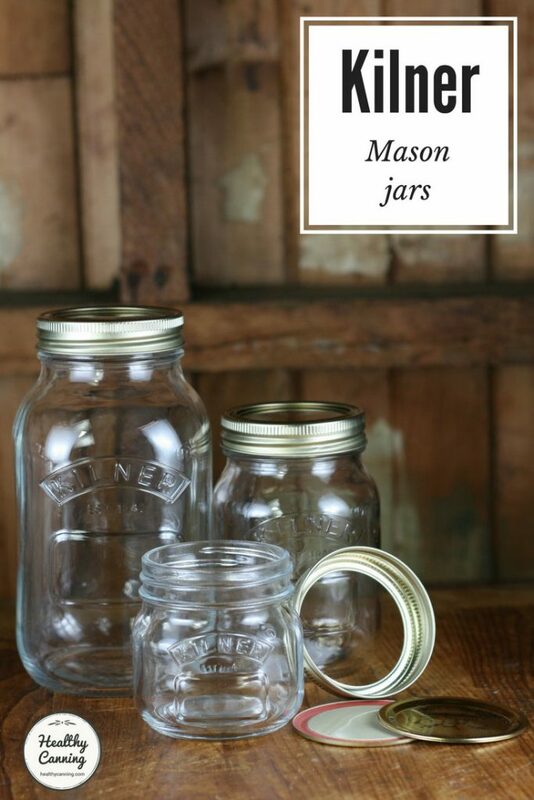 These vintage-style Mason jars were released C. 2015. One downside to these particular jars is that the design leaves no flat surface on the sides of the jar to affix a label onto: you may have to label the lid instead. They come with silver lids and screw bands. Any regular-mouth lids from any manufacturer work fine with them. However, something is “screwy” with the outside neck of the jars. Normal, regular-mouth screw bands seem to be just a micron too wide for them, or something, and will just spin on them instead of catching and tightening. So keep the screw bands from these jars always with the jars, or store them in a separate, marked bag away from regular screw bands to avoid frustration in the heat of actually trying to can with the jars. Christmas half-litre jars released for Christmas 2016. 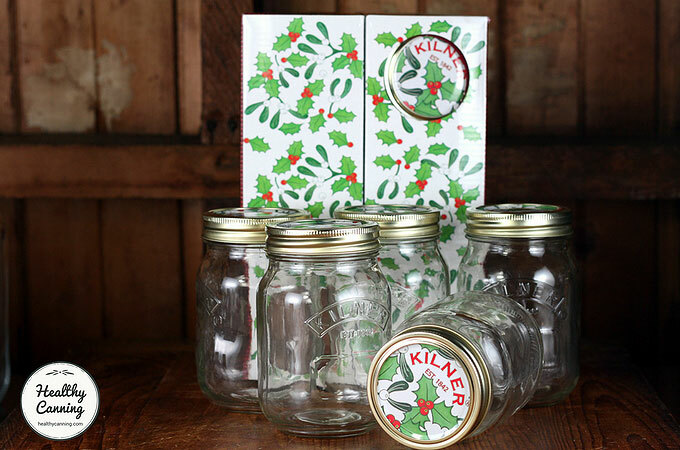 Seasonally, Kilner will release packs of jars, with special decorative lids. These particular half-litre (US pint) jars for Christmas 2016, weighing 220 g each, are noticeably lighter in weight than the half-litre jars sold separately, which weigh 320 g each. Aside from the weight and the lid, they are the same as the other half-litre Mason jars shown earlier above. It’s uncertain whether the lighter weight was just for that special release, or, indicated a permanent change in manufacturing. 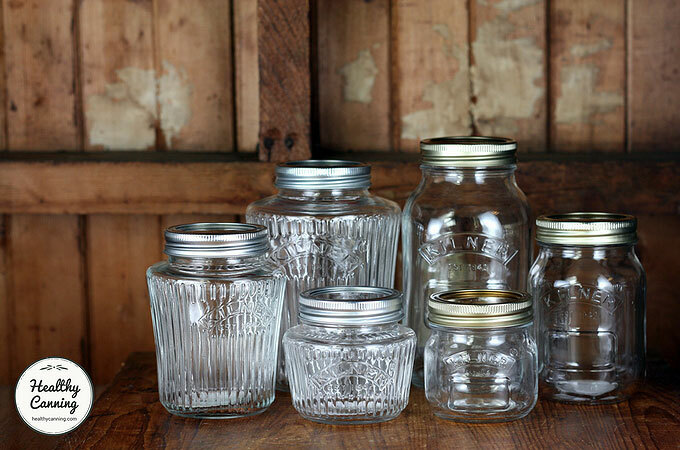 The Kilner jars (“standard” and “vintage”) shown above are the ones you would use to home can safely according to current modern, tested home canning standards. 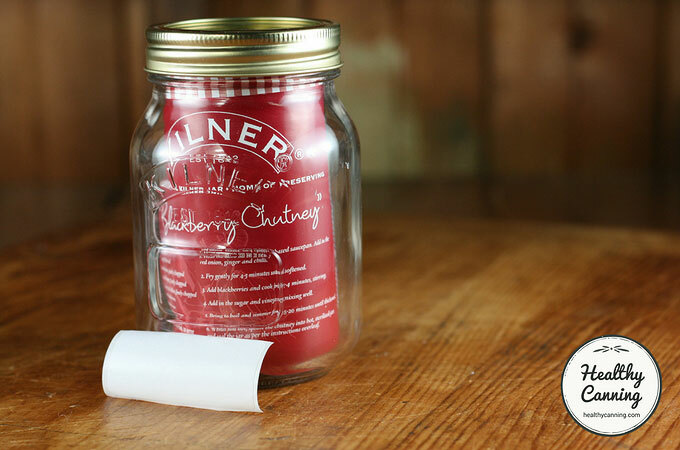 Healthy Canning is not able to endorse Kilner’s “clip-top” (clamp lid style) jars for shelf-stable home canning, because the USDA recommends against such jars for such usage. Those particular models of Kilner jars, though, are great for refrigerated storage, or dry shelf storage. 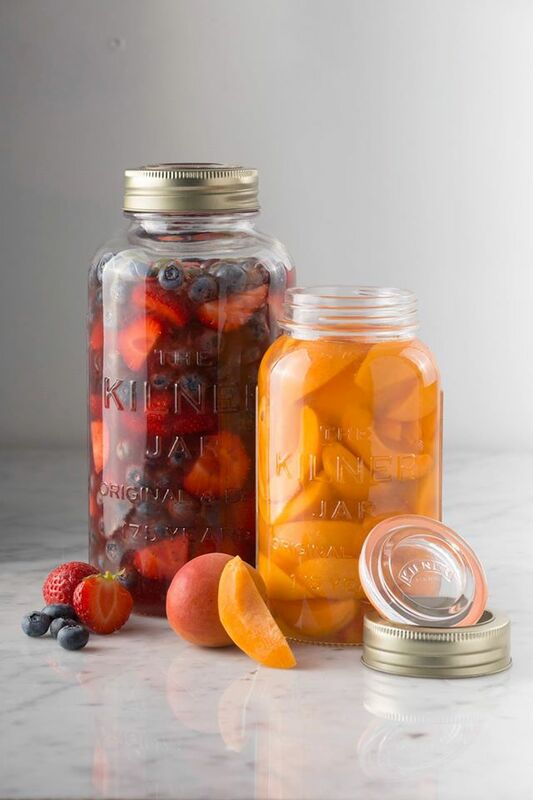 For home canning purposes, however, it’s Kilner’s Mason-style jars that would satisfy current safety and quality recommendations. 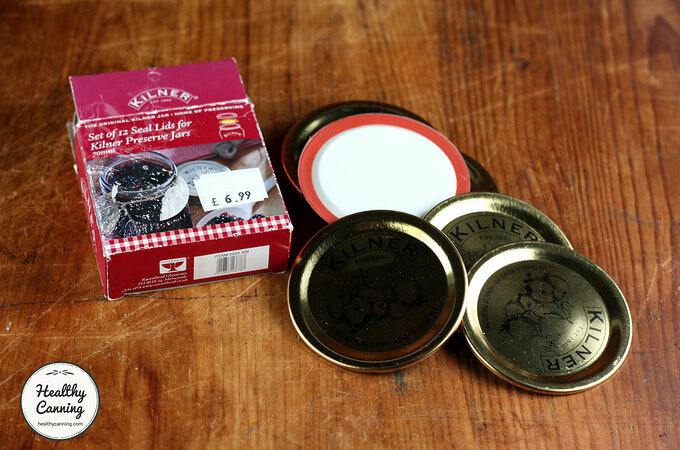 Kilner lids will look very familiar, as they are of a standard design with a rubber gasket on the bottom. Replacement lids are sold in packages of 12 in gold, or silver. Regular-mouth reusable Tattler lids will also fit the jars, as will 70 mm metal lids from other manufacturers. Seasonally, decorative lids are available, but to the best of our knowledge to date, they are only sold as part of a special package of jars with lids. After the seasonal lids have been used, you re-use the jars from then on forward with the regularly-decorated lids such as pictured above. Kilner supports the use of their Mason-style jars with two-piece lids in pressure canning. We asked them via their Facebook page. 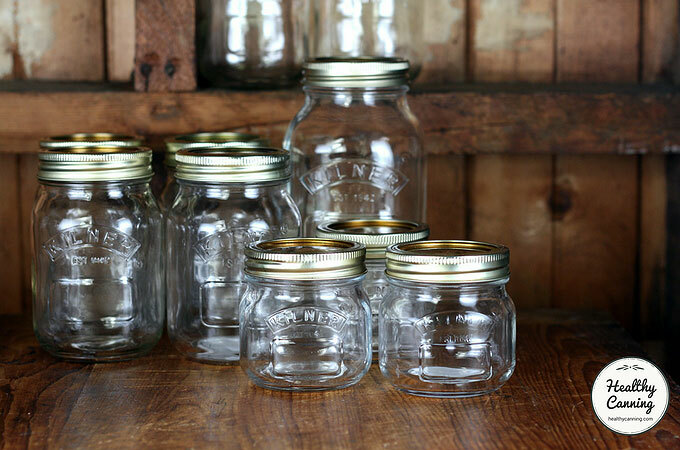 Q: A question please about the Mason-jar style ‘preserving jars’ with the two-piece lids (flat lid plus screw band.) Can you verify please if you support their use for the full range of home bottling, including pressure canning? 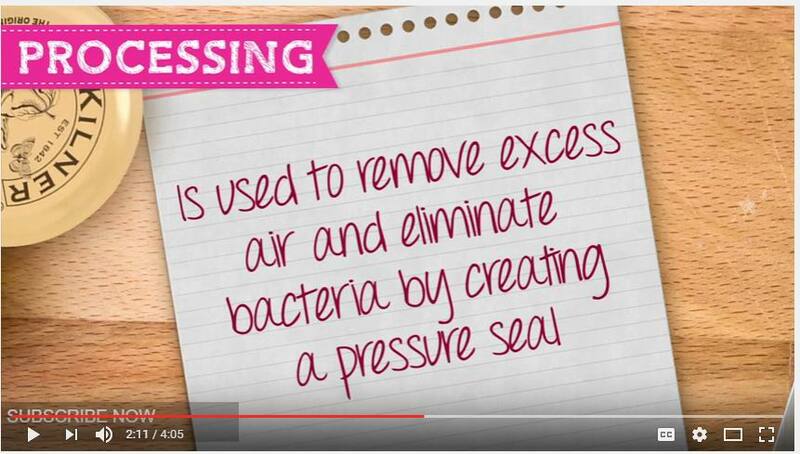 A: We can confidently say that you can use Kilner® with a pressure canner. We’ve been supplying North America with our products for many years and they’ve been used for this purpose without any issues or problems.” Kilner to Randal Oulton. 14 July 2017. Message on file. We did not ask about their bail-type lid jars, as current USDA recommendations don’t support their use for home-canning, anyway. 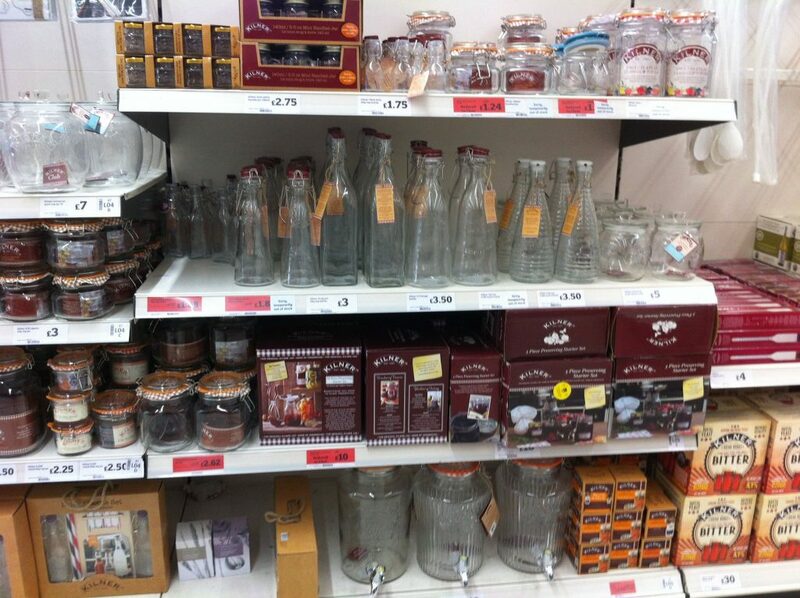 Here are some photos of Kilner products on store shelves, to give you a bit of an idea of the complete range. Note the many bottles sold for alcoholic products such as spirits and cordials, and for different types of storage — even non-storage uses! Kilner is returning more and more to its roots as a glassware company, with their expanding product range reflecting that. 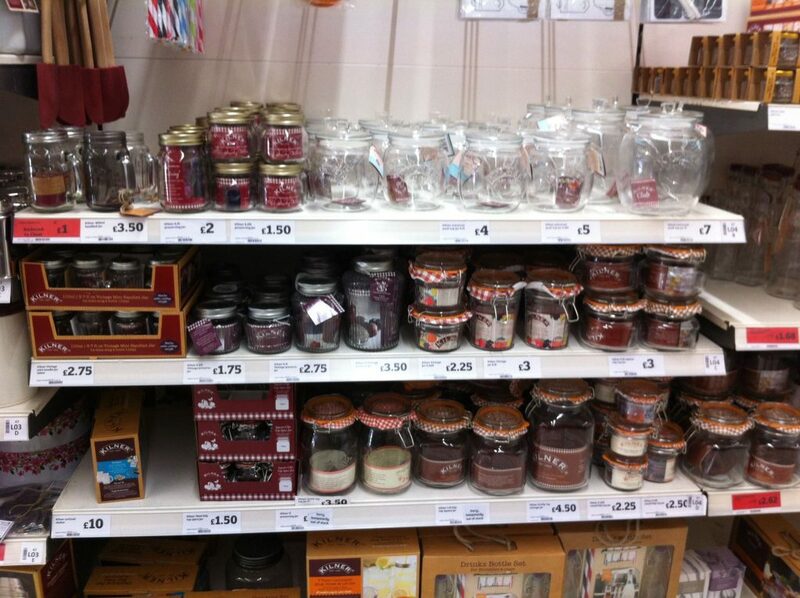 Kilner product range in Sainsbury’s Tollgate Road, Colchester, UK, December 2016. 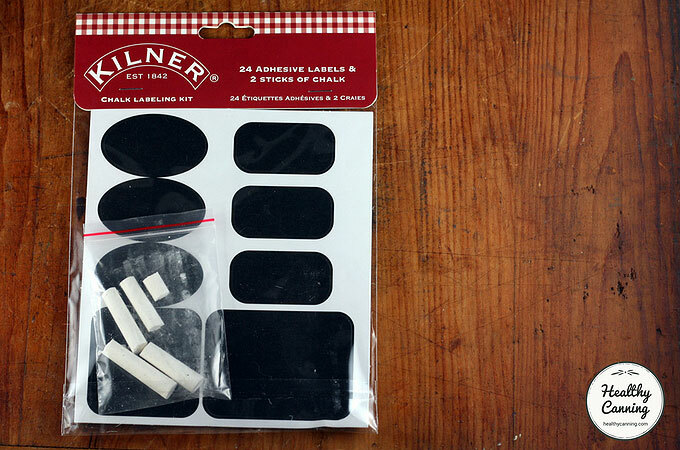 Bottom right shows Kilner beer brewing kits. Kilner range at cookware shop in Sudbury, Suffolk, December 2016. 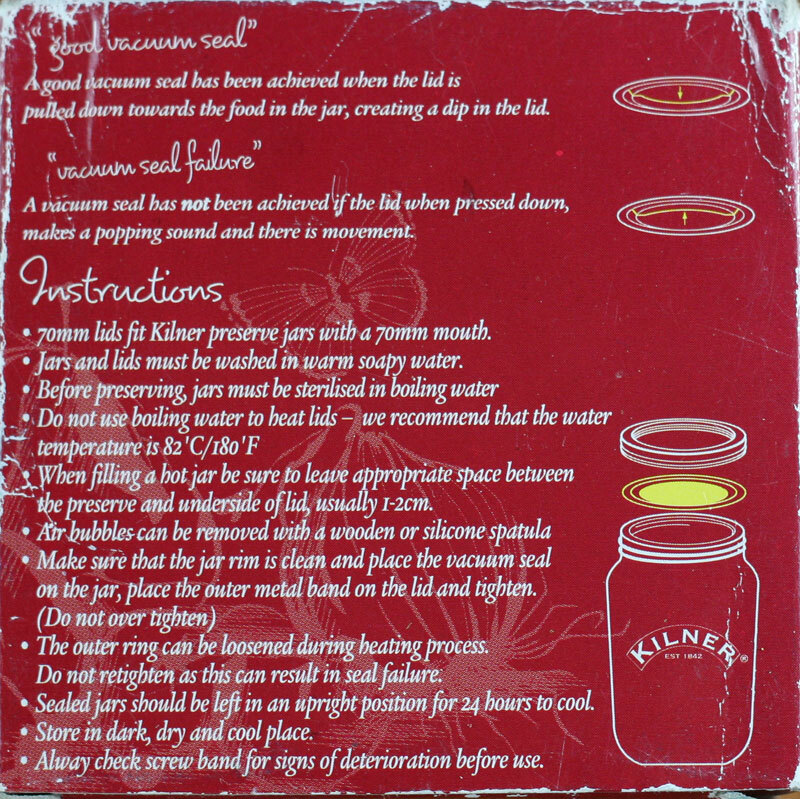 Below is a “photo tour” of some miscellaneous Kilner products. A decorative preserve jar cover. You fold it over the flat lid of the sealed jar, and secure it with a rubber band around the neck of the jar. Re-usable jar labels that you write on with chalk. We haven’t yet had the occasion to see how they will survive repeated washings and processing sessions with the jars. An assortment of various Kilner glass products, 2016. 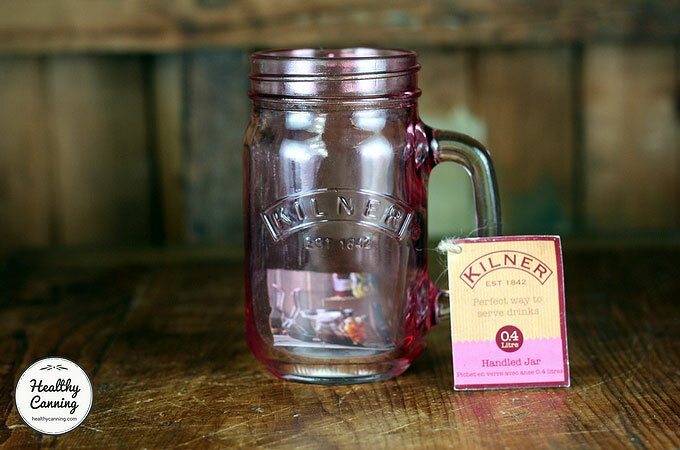 A Kilner Mason jar drinking mug, 2016. A clip-top (aka bail-type) coloured storage jar, 2016. A screw cap and screw lid accessory to transform a litre-sized (US quart) Mason jar into a cocktail shaker. The top screw-cap doubles as a measuring jigger: 25 ml up to its middle-line, 50 ml up to the brim. 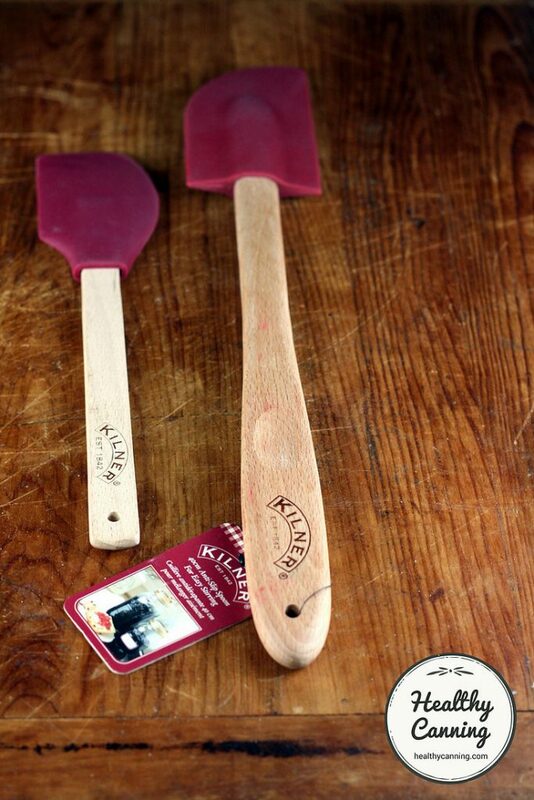 Two differently-sized Kilner-branded rubber spatulas. 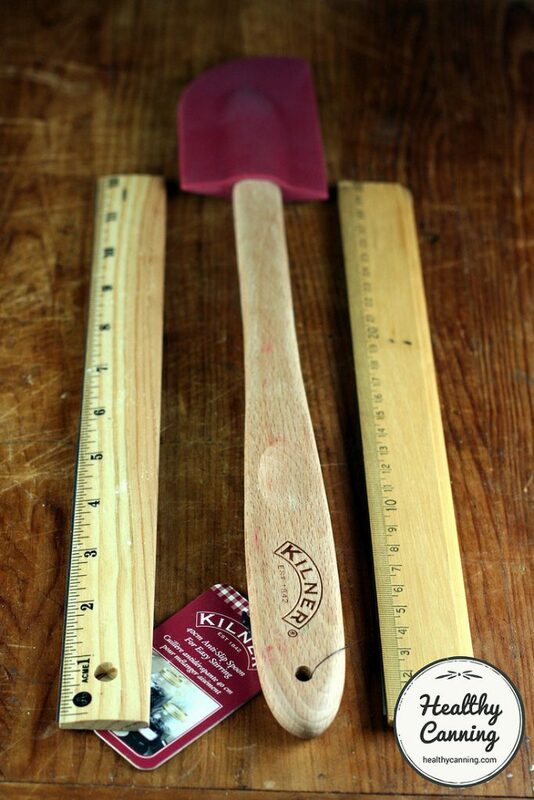 This is the long spatula — 15.5 inches / 39 cm in length. Very helpful for stirring the bottom of large simmering pots of condiments. 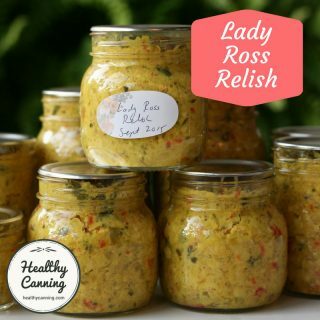 relishes, chutney, etc. to help reduce sticking. 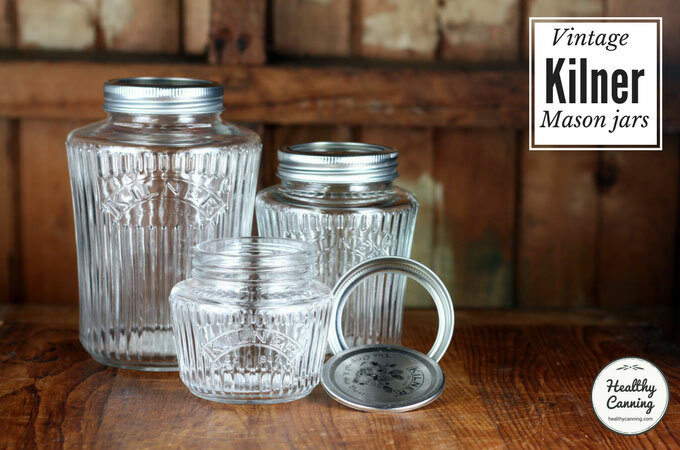 In the first few decades of the 1900s, Kilner’s Mason jars had glass lids on them. The closure system consisted of a glass lid, rubber sealing ring, and a thick screw band. This mechanism was the same as was used for many North American Mason jars. In 2017, Kilner issued a revived glass lid with rubber seal Mason jar for its 175th anniversary. The writing on the jars also reverts to a writing similar to that on older jars such as that shown above. Revived glass lid jar, issued 2017 for Kilner’s 175th Anniversary. Notice similarities with 1928 jar. Source: Kilner Site. This jar would be suitable for dry and refrigerated storage, but not shelf-stable home canning, as the USDA currently recommends against glass-lidded jars for that purpose. 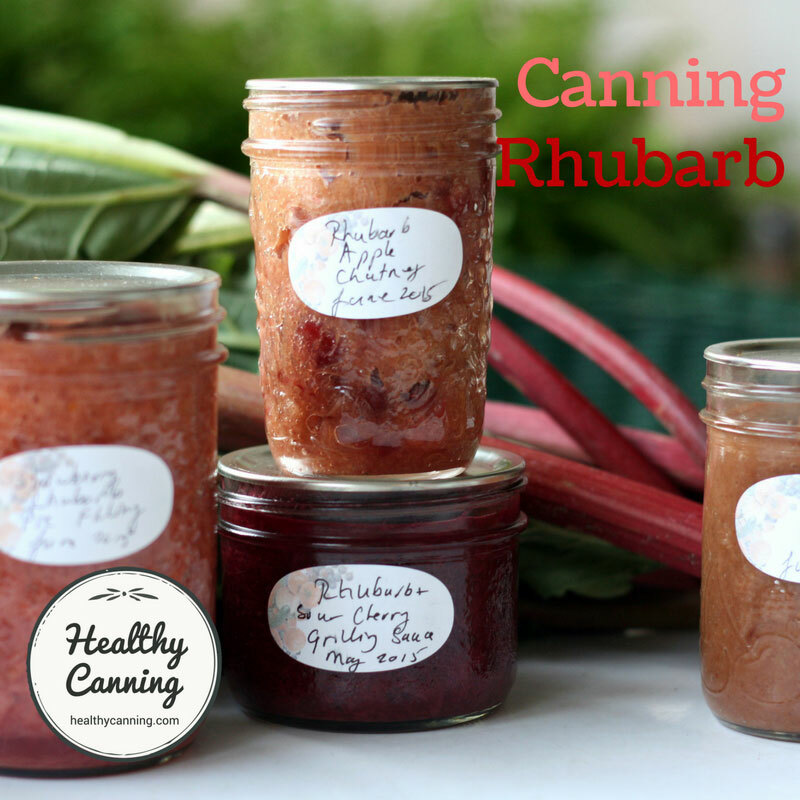 All jars of home preserves must be processed via water-bath canning, steam canning or pressure canning. It is never acceptable to just whack a lid on and set a jar aside to cool. If you are not sure why, follow that link in the sentence above. 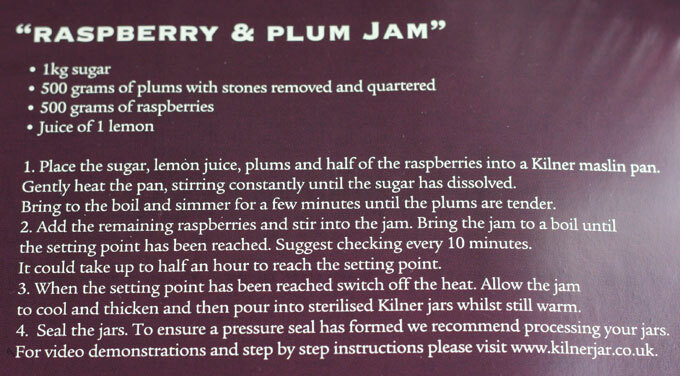 Kilner gives its customers very mixed messages about processing their jars of preserves. It almost feels as though there are different people with different ideas attempting to give guidance to consumers. 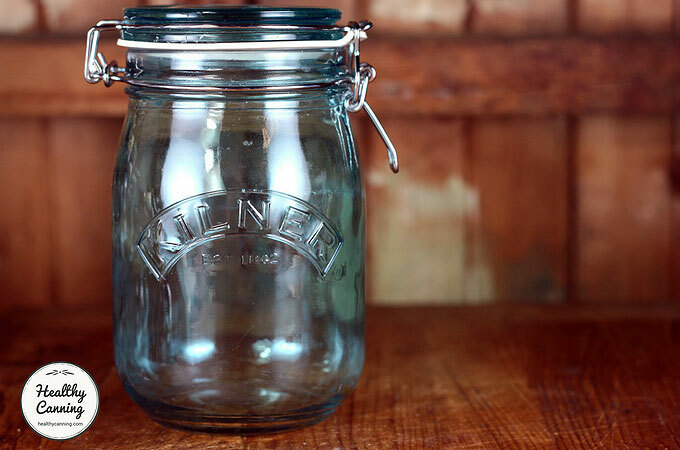 In a video Kilner posted on January 2014, it said that processing jars was an important part of the preserving process in order to eliminate bacteria. https://www.youtube.com/watch?v=pMKNtzzL0_o (02:00). 28 January 2014. However, most of the recipes they post on their web site omit the processing step. They instruct consumers to simply put the lid on the jar, and store it away on a shelf. On the back of a box of lids, mention of processing the jars is completely omitted. On top of all that, it appears that Kilner can’t agree why processing is a good idea. In some places, they say it’s to kill bacteria. In other places, they say it’s to get a better seal. The video seems to give a general processing time of 30 minutes — for everything, regardless of the product being processed. But, you just cannot generalize or guess at processing times. That 30 minutes might be too much for many products and ruin them. It could be too little for some others. [Determining processing time] has to be done separately with each food, as well as any variation that alters pH, consistency, texture, distribution of solids and liquids, or other factors that result in a “new’ product”. 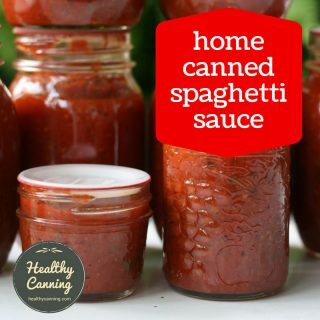 Experimentally determining safe processing times for home-canned foods is thus a lengthy, expensive and time-consuming process, which explains why there are fewer home-canned processes available than many people would like. 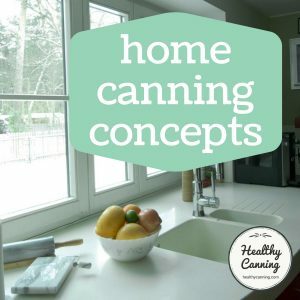 In short, there is no easy formula to work out processing times without experimentation and analysis that take into account how each food product heats in a particular canning situation.” D’sa, Elaine M. And Elizabeth L. Andress. Backgrounder: Heat Processing of Home-canned Foods. National Center for Home Food Preservation. 23 September 2016. Accessed February 2017. 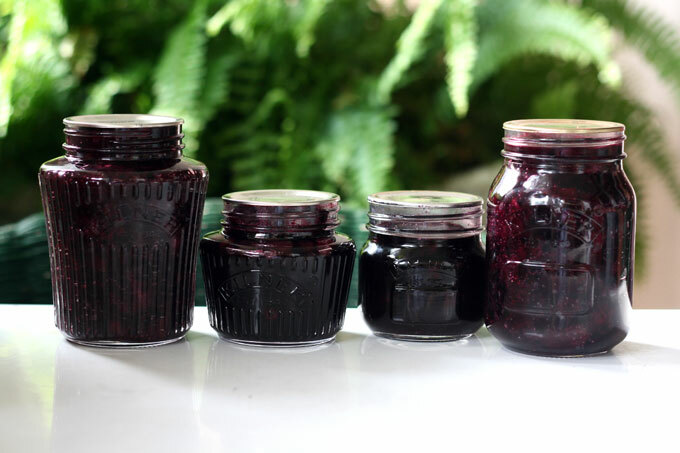 Why do you have to process jars of jam ? 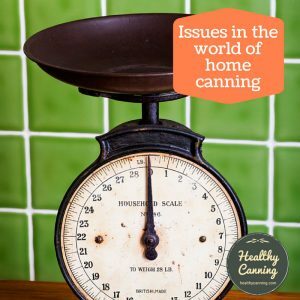 What does processing time mean in home canning? While not giving consistent messaging about processing the filled jars, Kilner does give consistent advice to go through the labour-intensive process of sterilizing the jars first. 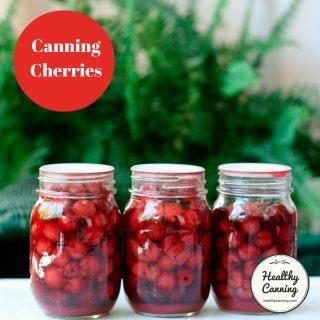 Sadly, Kilner’s canning advice is outdated and completely opposite to modern evidence-based research, which shows sterilization doesn’t actually help, but, that instead processing of the jars is always vital. 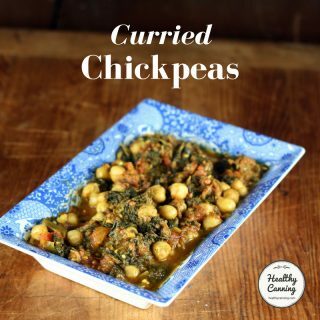 Owing to the lack of processing times given for most of their recipes, we are unable to recommend using any Kilner recipe intended for shelf-stable storage (the ones that they say are for refrigerated storage are fine.) This is current as of February 2017. In a video (mentioned above), they do at one point suggest processing your jars for 30 minutes. But that advice is ignored when it actually comes to most of their own recipes. And, a blanket time of “30 minutes” for everything does not instill confidence that they have actually tested each recipe to ascertain whether this is too much, or too little, for their varied recipes. 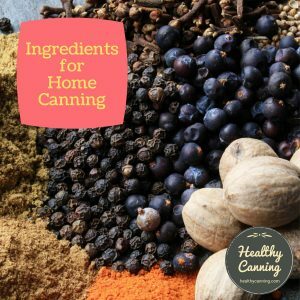 We were unable to see evidence that there are any trained people certified in modern home canning techniques qualified to give home canning advice behind any of the recipes. 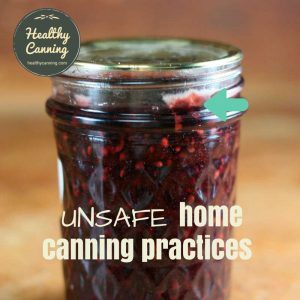 In fact, the general canning technique advice, and the inconsistent manner in which it appears here and there, would give the opposite impression. 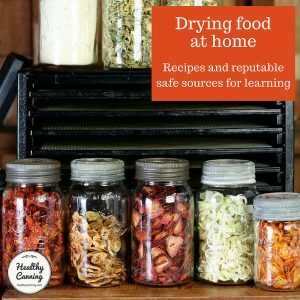 Given that Kilner is trying to ride the wave of modern interest in home preserving, and break into the North American market, our advice to Kilner would be to invest in getting someone trained in food microbiology and modern, research-based home canning techniques on board, and update all their home canning advice. Either that, or just refer people to another source such as the National Center’s site for advice and recipes. Otherwise, their attempts to land on North American shores could be met by an army of certified Master Food Preservers from coast to coast recommending against them. 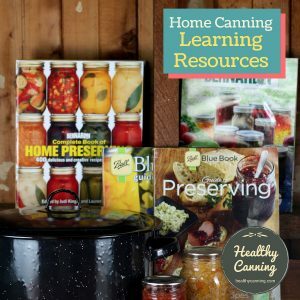 Our advice to consumers would be to learn how to recognize safe, reputable sources for home canning information, and use only recipe books from those reputable sources in using Kilner products. Blueberry pie filling and plain blueberries, both canned in Kilner jars using USDA recipes. In 1842, John Kilner founded John Kilner and Co. to make glass jars in Castleford, Yorkshire. John had four sons: George (married Charlotte) Death of Caleb Kilner – Business Genius. Mexborough Times. 5 March 1920, Caleb, John and Tom. In 1847, the company was renamed to John Kilner and Sons, and moved to Wakefield, Yorkshire. In 1848, Kilner added a factory in Thornhill Lees (now part of Dewsbury), in Yorkshire, by buying out another glass factory there. The factory would come to employ over 600 people. Potted history of our bottle industry. Dewsbury Reporter, Yorkshire. 14 October 2006. Accessed Feb. 2017 at https://www.brothersfive.ca/sb_kilner_brothers.html . It covered seven acres. In 1857, John Kilner Sr died, leaving the company to his sons. 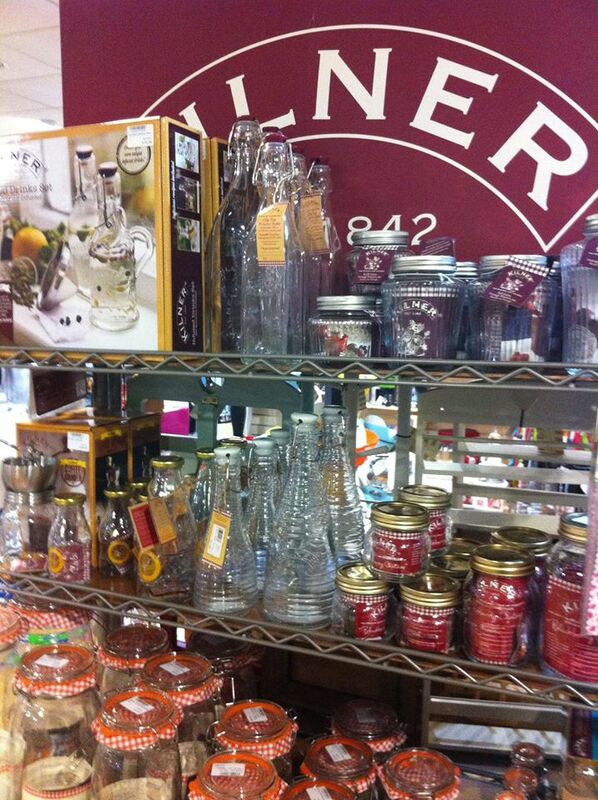 To reflect this, the company was renamed to Kilner Brothers Glass Co. In 1865 Caleb retired, and John Jr shortly afterwards. In 1876, there was a strike at both the Thornhill Lees and Conisbrough plants. Lockout of Yorkshire Glass Bottle Makers. Sheffield independent. 29 July 1976. In 1886, Caleb Sr and his wife Elizabeth die. They, like most of the Kilners, appear to have been Methodists and active with local Methodist chapels in Yorkshire. In 1906, “Caleb II” was made a Justice of the Peace for West Riding, Yorkshire. Conisbrough Magisterial Appointment. Mexborough and Swinton Times. 21 July 1906. In March 1920, “Caleb II” died. Mr Kilner was in his 77th year, and was the head of the well-known glass bottle firm of Kilner Brothers (Limited)……He was born in Castleford in 1843, the son of George and Charlotte Kilner, and the grandson of John Kilner, of Thornhill Lees, Dewsbury, the founder of the firm of Kilner brothers. He was educated at the Thornhill Grammar School, and entered his grandfather’s factory at a very early age. His first job, for which he was paid two shillings a week, was to prepare clay rolls for the Crucible makers. He learned, as a workman, every process of bottle manufacture, and, reached the bottle makers “chair” before he was 18 years of age. His practical education completed, he was given charge of a small department of the Thornhill works, and “making good.” There he was sent with his cousin, the late Kilner Bateson, to open a [branch in] Conisbrough, the Don Valley district, having just been “discovered” by the glass bottle trade. That was in 1866…. He was one of the leading employers in the Yorkshire section of the industry and was for several years president, and afterwards, vice president of the Yorkshire Glass Bottle Manufacturers Association. He also served on the Committee of the National Glass Bottle Manufacturers Association. Outside the three establishments of Kilner brothers, he had a number of commercial interests, including shipping. He was, from 1908 until his death, chairman of the Conisbrough Gas Company. In 1916, the work people at Conisbrough celebrated the Jubilee of the Conisbrough establishment by presenting to him, through his oldest work man, Mr Henry Senior (referred to above), a handsome silver salver…..
Mr Kilner’s oldest employee, Harry senior, who came within from Thornhill, said on a recent occasion that he had seen Mr Kilner, in those early days, working up to the waist in water……Mr Kilner was twice married; first Miss Sarah Kitson, of Thornhill Lees, and then to Miss Bates, a daughter of Alderman John Bates, of Dewsbury. His second wife died in 1911. Mr Kilner is survived by a son, Mr George Kilner, who was associated with him in the direction of the firm, and two married daughters. The courtege was headed by the deceased’s work people, about 400 in number, who lined the entrance to the cemetery, while the body of their beloved employer was carried to its last resting place.” Death of Caleb Kilner. Mexborough Times. 5 March 1920. In 1920, following “Caleb II”‘s death, his son George, aged 48, (c. 1872 to 1940) became managing director. Two of the three shops at the Conisbrough Glass Bottle Works (Kilner Brothers), were laid idle for four days last week owing to a lightening strike of the boys, who suddenly left their work on Tuesday night, on a complaint that improvements to machinery had diminished their output and earnings, and increased their labour.” Conisboro’ Glass Works – A Return to Work. Mexborough Times. 23 October 1920. In 1922, the Thornhill Lees / Dewsbury factory was closed. In 1935, there were rumours of financial problems at Conisbrough as well. Conisborough has been agog with rumours regarding an industry second only in importance to coal mining in this township. Mr. George Kilner, managing director of Kilner, Bror., Ltd., stated in reply to inquiries that a receiver had been appointed and that the firm was ‘carrying on for the present.’ For nearly a century this firm has been world-famous and Conisborough hopes that it will long continue to be so.” Conisborough News – Kilner Brothers. Mexborough & Swinton Times. 12 July 1935. In July 1936, there was another strike at the Conisbrough plant. The lightening strike which occurred at the Glass Bottle Works of Messrs Kilner Bros on Friday had an equally swift settlement the same evening. The works were thrown idle when trouble arose amongst the girl employees, of whom there are about 400….It is understood that the issue was over details of administration.” Lightening Strike – Messrs Kilner Bros. Mexborough & Swinton Times. 31 July 1936. Mr. Kilner, who was born in one of the block of cottages (now demolished) at the Glassworks of Messrs. Kilner Brothers. Ltd., with which firm his father, the late Mr. Caleb Kilner, was so prominently connected, spent the whole of his business career with this important firm of glass bottle manufacturers, which began its life in 1844 at Thornhill Lees, near Dewsbury, and later moved to Conisbrough. He was educated at Mr. Jackson’s private school in Hallgate, Doncaster and entered the business at the age of 16. He passed through all departments and in 1913 he was appointed a director. In 1920, on the death of his father, he succeeded Mr. Caleb Kilner as managing director and held that position until the firm closed about 12 months ago…. Mr. Kilner, who on occasions undertook business journeys for the firm abroad during which he visited Germany and France, had the experience of returning to Britain from Germany just before the Great War began….Mr. Kilner leaves a widow and one daughter, Miss Audrey Kilner.” Obituary: Mr. G. Kilner. Mexborough & Swinton Times. 20 January 1940. In the early 1970s, the company was renamed from United Glass to Ravenhead, reflecting one of the names of the original companies which made up United Glass. That original company had been formed near Ravenhead Colliery, Lancashire. In 1987, Ravenhead was bought out by Owens-Illinois of USA, and made part of its Libbey Glass USA operations. https://ravenhead.co.uk/the-ravenhead-story. Accessed January 2017. In 1993, Owens-Illinois sold Ravenhead off to the Belgian glassware company Durobor. https://ravenhead.co.uk/the-ravenhead-story . Accessed January 2017. In 2003, the Rayware company purchased Ravenhead, along with the Kilner line of products, from Durobor. https://ravenhead.co.uk/the-ravenhead-story . Accessed January 2017. At some point, production of Kilner jars was shifted to China, but we have been unable as of yet to find in which year that shift happened. 1. ↑ Correspondence on file. Rayware Group on behalf of Kilner. Facebook PM. 6 May 2015. 2. ↑ Kilner to Randal Oulton. 14 July 2017. Message on file. 3. ↑ D’sa, Elaine M. And Elizabeth L. Andress. 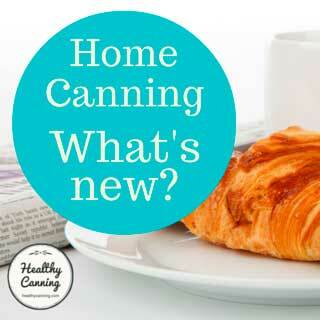 Backgrounder: Heat Processing of Home-canned Foods. National Center for Home Food Preservation. 23 September 2016. Accessed February 2017. 8. ↑ Death of Caleb Kilner – Business Genius. Mexborough Times. 5 March 1920. 11. ↑ Lockout of Yorkshire Glass Bottle Makers. Sheffield independent. 29 July 1976. 12. ↑ Conisbrough Magisterial Appointment. Mexborough and Swinton Times. 21 July 1906. 13. ↑ Death of Caleb Kilner. Mexborough Times. 5 March 1920. 14. ↑ Conisboro’ Glass Works – A Return to Work. Mexborough Times. 23 October 1920. 16. 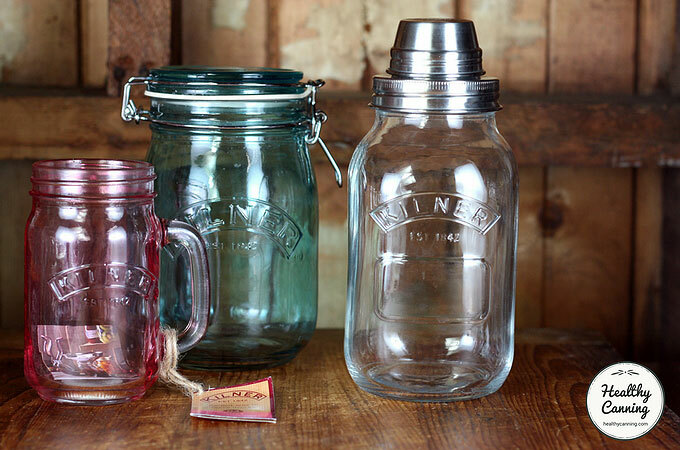 ↑ Conisborough News – Kilner Brothers. Mexborough & Swinton Times. 12 July 1935. 17. ↑ Lightening Strike – Messrs Kilner Bros. Mexborough & Swinton Times. 31 July 1936. 19. ↑ Obituary: Mr. G. Kilner. Mexborough & Swinton Times. 20 January 1940. 23. ↑ https://ravenhead.co.uk/the-ravenhead-story. Accessed January 2017. 24. ↑ https://ravenhead.co.uk/the-ravenhead-story . Accessed January 2017. 25. ↑ https://ravenhead.co.uk/the-ravenhead-story . Accessed January 2017.